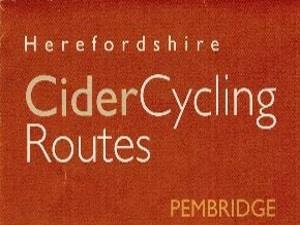 Herefordshire Cider Cycling – Pembridge at Herefordshire Cider Cycling - Pembridge01568 616460work Cycle RouteWhat better way to see, hear and smell the beautiful Herefordshire countryside than by bike! Stop on a whim, admire the detail of the scenery and meet the cider producers who welcome visitors to share their passion for cider and perry. Pembridge Cider Cycling Front CoverFollow the 19 mile loop, viewing the black and white architecture or explore further along the recommended detours along quiet lanes in one of England’s finest cider growing areas. Download the leaflet HERE or purchase it online HERE. Or for a more relaxed tour of the local cider producers that have opened their doors allowing you to peep into the fascinating world of cider and perry production, why not follow the Herefordshire & The Wye Valley Cider Route by car.